Tangent podcasts are tangent. The Random Battles are short mini-shows that will show up in your feed as we discuss one topic at a time. Yes, the do fit into the continuity of the SideQuest. We have a terrific episode of the Random Battle this time around — well, they’re ALWAYS terrific, this one is just quite possibly more terrific than the rest. 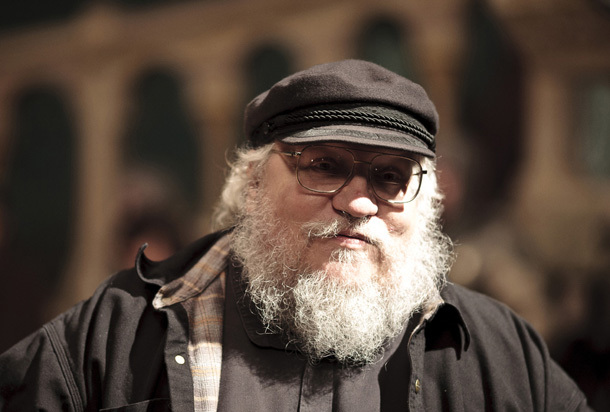 We’re joined by one of our literary heroes, author George RR Martin, to talk about his incredible career. Points of discussion include the process of creating a giant world and how that ties into the story development, the challenges of moving from book to television screen, and how the IP stays focused across books, comics, table top games, and video games. We also do a little celebratory dance for the New York Giants winning the SuperBowl. Please pardon us for some of the audio quality issues. We had some initial technical difficulties. We’ll follow up with a full write-up of the interview tomorrow, including recorded questions that didn’t make it onto the podcast. How does scoring take place and what does it mean? For completing a Random Battle, the party member gains XP. For every 3 battles, the player levels up. At the end of the season, the highest-level player gets a SideQuesting surprise gift. The XP then resets at the beginning of the next season. Special thanks to Michael and our friends at Cast of Thrones, the BEST podcast about all things A Song of Ice & Fire and the Game of Thrones television series. Thank you to everyone for submitting questions via the website or Twitter. We used many of them in our interview.